Dog Kennels in Wausau, WI. Our dog boarding kennel is completely indoors and climate-controlled. Our indoor facility keeps pets indoors during extreme Wisconsin Winters. The kennel builiding is well-ventilated and features vaulted ceilings, windows, 11 skylights for natural lighting and soft music 24/7. 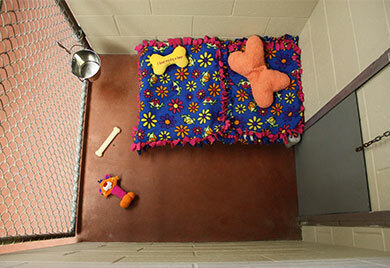 Each dogs enjoys their own personal kennel run separate from their neighbors by privacy divider walls. We have 2 kennel sizes to accommodate larger breeds.